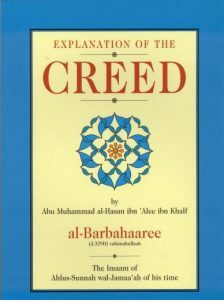 The book Sharh-us-Sunnah (Explanation of the Islamic Creed) consists of 170 points on different aspects of the Muslim creed, referring to passages of the Qur’an and authentic sayings of Prophet Muhammad (صلى الله عليه وسلم). Ample sayings of the early scholars are also included. In every age, there has been a noble company of scholars who stood firm and expended great efforts in defending the Book of Allah and the Sunnah of His Messenger (صلى الله عليه وسلم) and in refuting the people of innovated beliefs, deviation, and misguidance. At the head of these noble scholars towards the end of the third century and the beginning of the fourth was the Imaam who aided the Sunnah and subdued innovation: Abu Muhammad al-Hasan ibn ‘Alee al-Barbahari (died in year 329 AH). Posted in Media library and tagged featured-media.